The Hacking Culture Bootcamp, held from the 8th till the 10th of May was a huge success. The beautiful venue of the Waag Society in Amsterdam acted as the playground for over forty participants working in groups to build their applications. During these three days game developers, storytellers, interactive designers, and app developers created new multi-screen experiences with a focus on digitised historic footage. 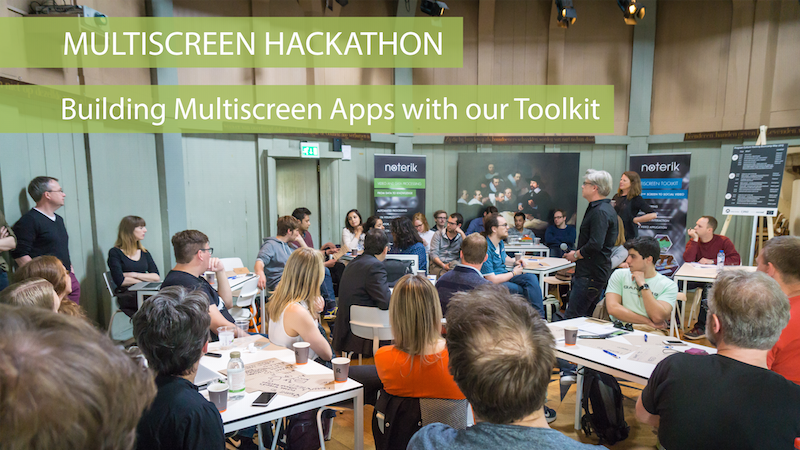 To give participants a hands-on experience of multiscreen interaction we built a number of social multiscreen games (youtube) that could be played at the event. Participants were able to play by connecting their mobile phones with the screens of the games. All the scores and stats were available on a leaderboard. As everyone was working very hard on their products, stepping away from their desks to play a game every now and then was a welcome distraction. Noterik acted as technology partner of the event by allowing teams to make use of our Multiscreen Toolkit which is available on Github. With the Toolkit a number of teams were able to build a working prototype in the scope of just two days. It allowed the teams to work seamlessly with video across devices and screens. To name a few example apps that came out of the Hackathon, team Carrot built a collaborative multi-screen learning platform with the main focus on educational settings. Students are able to interact with the learning material using their own mobile device. They can annotate video and build their own collage of fragments that are of interest and share them with each other and the teachers. The team from World Press Photo developed an application with the Multiscreen Toolkit that allows the visitor to select a theme for their exhibition and then play/control with several projection installations that are part of it. Phone interactions include swiping through a story prompting three large screens to simultaneously change their picture, zooming and moving a high-res picture projected on a large screen and use the smart phone to play an audio track that contains the story behind the picture. One of the prize winners, Team Bosch, used our Multiscreen Toolkit to build an application that enables viewers of a painting to move a spotlight over the picture in order to identify different characters in the painting. Once identified the user can either listen to sounds that previous people recorded for that character or add a voice recording themselves. The effect of the application is both enriching and engaging. It helps visitors to see different characters in a painting and imagining their position in the story of the painting. The audio samples that are added to the painting also bring the painting to life, not only for the single occasion but over time as well, creating new narratives and layers of meaning, and, to use the phrase coined by the team, ‘give the artwork a voice’. All in all it was a very inspiring weekend. We witnessed the birth of some very good applications all built in the course of just a weekend. We like to thank the various groups of participants for bringing their expertise and the fact that our ideas resulted in real working prototypes makes us confident that we will see more of these apps in the very near future.